Among my roles as homemaker, I am the manager of time, activities, and money. In the work world, I could be called office manager, bookkeeper, and my favorite, travel agent. The vacation itinerary falls on my shoulders. I am keeper of the household calendar and schedules. And, the checkbook fits neatly into my hands. But it wasn’t always this way. When we were married some thirty-five years ago, our income was small and our expenses little, but as our family enlarged and our income increased, so did our expenses. Arguments over money also rose. There were disagreements over fun money; you know, the selfish pleasure spending stuff. The credit/debit/ATM cards brought on a flurry of new squabbles. We even fought over whose responsibility it was to actually keep track of our money. Around and around we went about whose role it was. Then, about ten years into our marriage, I discovered Crown Financial Ministries on the radio (at the time, it was called Christian Financial Concepts) with Larry Burkett. He taught me God’s principles for managing money, a concept I hadn’t learned in any of those classes. Burkett explained how couples could manage their money together with communication being the key, along with what should be done rather than who should do what. I shared—maybe annoyed—what I learned with my husband. I contacted the ministry, received a copy of the budget plan, and together we determined to follow it. As we settled into our roles and adjusted our lifestyle to live within the budget boundaries, our money arguments lessened. In the weeks to come, I will expand on what my husband and I learned about being godly stewards of worldly riches, as well as those I learned of a travel agent and office manager. 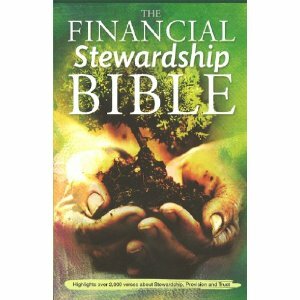 Be a winner: Because I believe everyone should experience financial freedom, I have two copies of “The Financial Stewardship Bible” to give away March 31st to Fellow Sojourners of this site. Leave a comment to one of the March 2012 posts and tell why you wish to receive a copy.